Friday April 10th 1891 I was busy all the forenoon doing baking and taking care of the house. I practiced in the afternoon and read most of the evening. I churned, dressed chickens, and made bread at supper time. I had a letter from Mother. Saturday April 11th 1891 I done a lot of baking besides the other work in the forenoon. I was working in the yard while Agnes washed dinner dishes. I worked on the net in the afternoon and evening as I had a sore finger I could not practice. Agnes went home to stay all night. Sunday April 12th 1891 It was a pleasnt forenoon. I got the house all cleaned up before Agnes got back. Will was in town. We found "Flora" had a little colt this morning. Will and I went over to Woolfs in the afternoon. Read in the evening. Monday April 13th 1891 We worked in the forenoon and I ironed some things in the afternoon while Agnes went to town for me. Will was getting started at sowing the oats. I was too tired in the eve to work so went to bed early. Fanny had a surgical operation performed yesterday. Willie stayed over there last night. his brother George was here. Tuesday April 14th 1891 We finished the ironing and got our work all done in good shape this morning and Agnes and I drove "Nellie" over to Wood Lawn in the afternoon. Fanny was not very comfortable. I done my evening work after coming home. Will finished sowing the oats today. 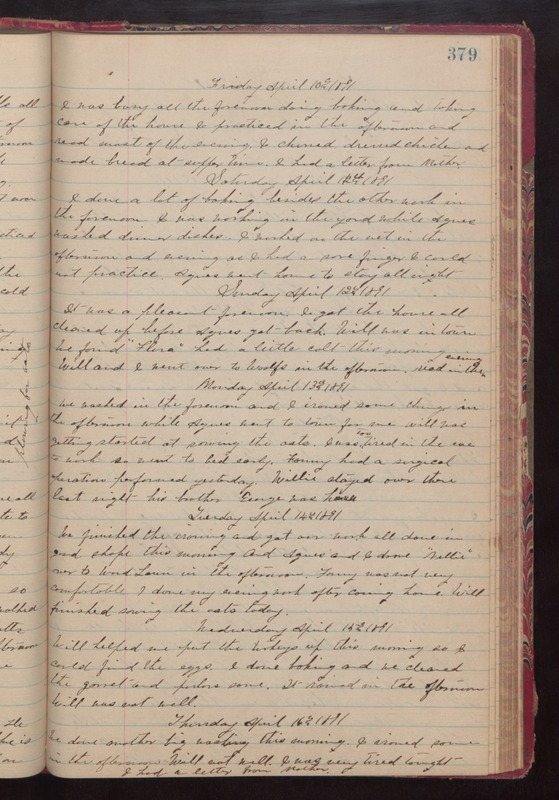 Wednesday April 15th 1891 Will helped me put the turkeys up this morning so I could find the eggs. I done baking and we cleaned the garret and parlors some. It rained in the afternoon. Will was not well. Thursday April 16th 1891 We done another big washing this morning. I ironed some in the afternoon. Will not well. I was very tired tonight. I had a letter from Mother.